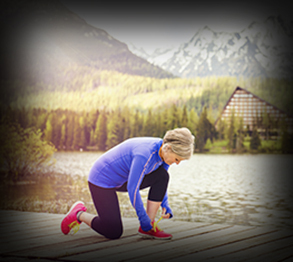 This Special Health Report will help you find the perfect cardio routine—whether you are just beginning, need to freshen up a routine, or are ready to take your cardio workouts to the next level. For beginners or people with conditions that limit their mobility, there are three options to start with: a Basic Cardio, Beginner's Walking, and a Pool Workout. If you’re looking to add some variety to an existing cardio routine, try our Cardio Dance or Kickboxing Workout. If you’ve been doing cardio exercise and want to challenge yourself, try our Interval Walking Workout or Step Workout. When you’re ready to move on, a Special Section will help you design your own program. No matter what form of cardio you do, you’ll be healthier. Do you get winded climbing stairs? Have trouble keeping up with your kids or grandkids? Wish that you had more energy to power through your day? If so, it’s a good indicator that you need to either start doing some type of cardio exercise or else kick your current routine up a notch. Even if you can sprint down the block with ease, you’re not off the hook. Whether you’re young, old, male, female, healthy, ill, pregnant, or disabled, you should be doing some form of regular cardio exercise. It is the cornerstone of any effective fitness program and a key to living a longer, more joyful life. What’s more, the payoffs are impressive—from lowering your risk of heart disease, stroke, diabetes, and some types of cancer to helping to improve your sleep and mood. No matter your level of fitness, there are forms of cardio exercise you can do. Also called aerobic or endurance exercise, cardio is any activity that gets you breathing a little harder and increases your heart rate. Low-intensity activities (such as walking your dog or waltzing) count. So do moderate-intensity activities (brisk walking or Zumba) and high-intensity exercise (running or kickboxing). There are even exercise options for those who are frail or have limited mobility, such as hand cranks that are like bicycles you pedal with your arms and anti-gravity treadmills that enclose your lower body and the treadmill in an airtight bubble to reduce impact as you walk or run. Some of the options, such as swimming or cycling, require specific equipment or locations. Others, like kickboxing or aerobic dance, might best be done in a class, but even for these activities,there are home options like DVDs, digital downloads, and, of course, the workouts in this report. And then there are cardio activities like walking or jogging that you can do just about anywhere. You could even walk around your office building, a hospital, or a mall, so there’s really no excuse! 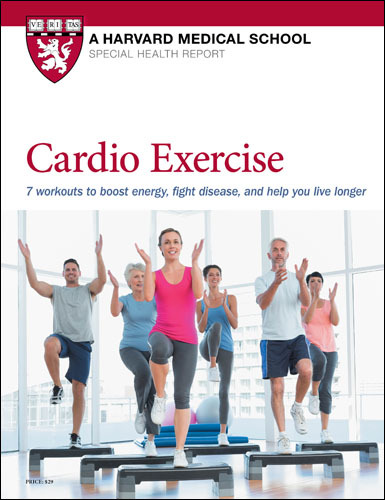 This Special Health Report will help you find the perfect cardio routine—whether you are just beginning, need to freshen up a routine, or are ready to take your cardio workouts to the next level. For beginners or people with conditions that limit their mobility, there are three options to start with: a Basic Cardio Workout you can do in your living room , a Beginner Walking Workout , and a Pool Workout. If you’re looking to add some variety to an existing cardio routine, try our Cardio Dance Workout or Kickboxing Workout. If you’ve been doing cardio exercise and want to challenge yourself, try our Interval Walking Workout or Step Workout . When you’re ready to move on, a Special Section will help you design your own program. No matter what form of cardio you do, you’ll be healthier. Cardio, aerobics, step, calisthenics—what does it all mean? . The nuts and bolts—what, when, how much?